Now I will wait 19 pens. Form submitted for a Model 3, teal-black ripple, chrome clip, bakul finish, no nib. Great to hear this news, Can you tell me what are these pens' size different with emperor? Does the "Acrylic Demonstrator" Version with full pen Polished so I can see through the whole pen? I understand! Oh well. The last couple of group buys I seen have been for Bock - hope they bring back the Jowos one of these days. Form submitted. Was told to wait for email for payment instructions - never received. Please advise. Please disregard my group #2 order form submission and I will special order the pen in the smaller size. Payment request received and payment sent. Kandan sir, please let me know if not received. 1. What is meant by " buy 2 of Ramga pens". Does this mean we choose two pens etc? 2. Are these with bock screw in nibs with the housing or just the nib itself. 3.When will the pens be delivered? 4. Is shipping included in the price? How do I order the 6th pen? 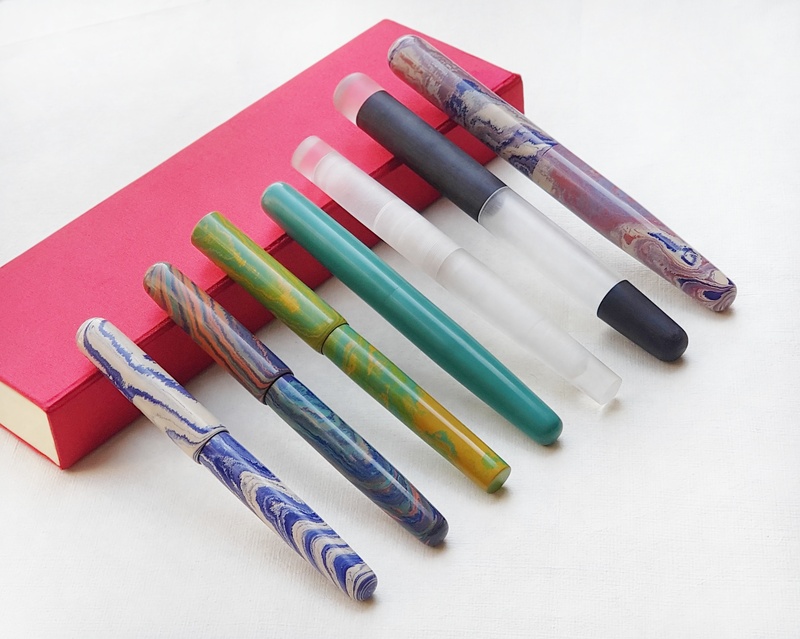 I want exactly that one, the Model 5A Demonstrator with Ebonite Cap and Section. Do I just mention that in the comments of the form? Edited by gryphon1911, 03 February 2018 - 01:53. 1. This is "Mega-Group Buy 2", as in, the second time Mr Kandan has done a "mega" group buy that allows you to choose from a range of pen designs. Previous Ranga group buys were for a single model only. You choose *one* pen from among the five options provided - unless you *want* to buy more . 2. These are Bock screw-in nib units - nib, feed and housing all included, plus (I believe) a Schmidt cartridge converter. If you already have a #6 Bock unit lying around (as I did), you can order the pen minus nib unit, and save about $14 on the order (I think - check what the Group buy says). 3. Mr Kandan will bill you within a few days of receiving your order, then add your pen to his manufacturing "queue" once he's received payment. All pens are made to order. I'd expect you're looking at 4-6 weeks for the pen to be made (based on previous experience), then a couple of weeks for the pen to arrive. 4. International shipping is included in the price. I now have (I think) about 6 Ranga pens - I'm sitting this one out (probably) because I've already got a Model 5, a Model 4B, and two Model 3s. I can't speak highly enough of Ranga's workmanship - especially for the pens he designs to hold JoWo or Bock nib assemblies! Edited by Jamerelbe, 03 February 2018 - 04:02. Excited for another Ranga Group Buy... thanks for arranging it for us. *Waiting for invoice / confirmation with total amount due to send PayPal. Thanks so much! Was a huge help. Do you know if I have the choice of having theboen made to fit a Jowo screw in nib ? Are these made to fit #6 Bock and finallybwhat isbthe advantage of buying directly here through the group buy rather than from ranga in ebay or Peyton street pens. Is there a dosciuntnif buy more than one? Thanks so much! Several of Ranga's previous group buys gave the option of JoWo (or Schmidt) nib assemblies, or eyedropper pens with ebonite feed and generic nib. This group buy is Bock nib assemblies *only* - so, no, you won't be able to ask for the pen to be threaded for a JoWo or other nib assembly. I don't think there's any discount for buying multiple pens - though you'd have to ask Mr Kandan. Maybe if you were ordering a *huge* number? The advantage of a Group Buy is that the purchase price is cheaper - as long as you're happy with the options that are available! If not, you can buy via eBay or contact Mr Kandan directly to talk about other alternatives - but you'll pay a little more for the 'privilege'. Form submitted. x1 #3C in Teal/Black Swirl with Duo Tone nib in M, clipless. 2. Customisation option like grip width or shape, pen length etc. And for the first part of your query.. Please note that this group buy is for various pen models but only with bock nib. We will be doing different group buy later with various nibs.but that will be only for one pen at a time. What are the dimensions of each of the models? Length, weight, width? Can a particular model be shortened or lengthened? Can all models come either with a domed cap and domed body end or a flat top and flat body end? 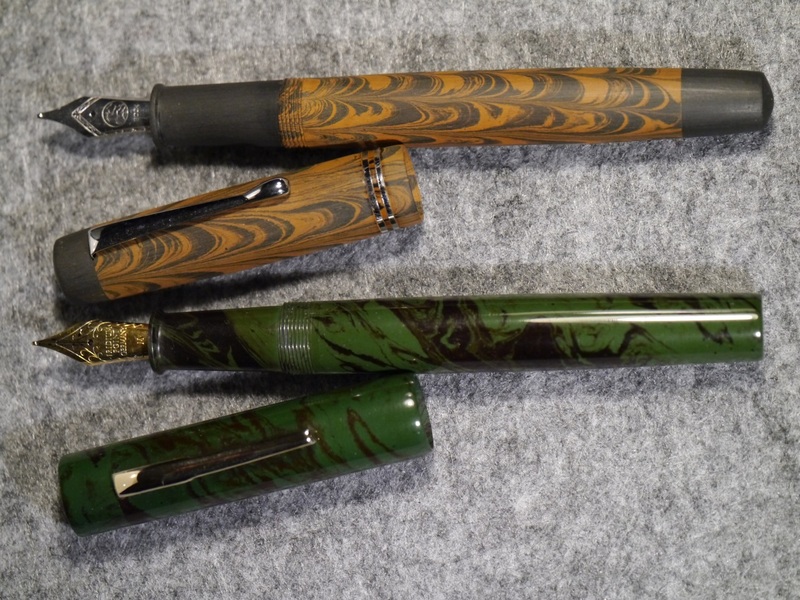 Which Gama Pens Are These?